Racial tensions seem to be reaching a fever pitch in the US, set off by a series of killings of unarmed black males by the police. 22 year old John Crawford was shot dead in a Beavercreak, Ohio Walmart (August 5th, 2014) for apparently failing to put down a toy gun he was purchasing for his son. 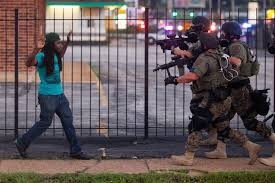 (August 9th, 2014) 18 year old Michael Brown was shot and killed in Ferguson, Missouri. Police claim the teenage was banishing a weapon although eye-witnesses on the scene say Mr. Brown was killed with his hands in the air and was complying with the officers that shot him. Only making things worse, were five days of violence that followed by militarized riot gear cops shooting tear gas and rubber bullets at demonstrators who took to the streets to protest a long history of racial motivated harassment. Both incidents and a similar killing of 25 year old, Ezell Ford in Los Angeles come in the shadow of a fourth homicide right here in NYC. 43 year old Staten Island resident Eric Garner, a father of six children who pleaded with officers that he couldn’t breathe during a choke hold–Not to mention a whole team of EMS workers who stood by and did nothing…all captured on video in broad daylight. This is the first case of an unarmed black man being killed in NYC within mayor DeBlasio’s watch which definitely has local citizens concerned about how it will be handled, especially with such a long history of similar killings during past administrations all ending in officer acquittals. Race is definitely a factor in these killings but doesn’t seemed to be addressed by the NYPD or other police forces, who would much rather discuss a few bad apple officers or debate whether the victims were “resisting arrest.” Within this politically charged climate…the police have scrutinized over their priorities and come up with: Operation Safe Cycle? A rather Orwellian term to crack down on bad biking behavior. I’m sure this will ease the family of Eric Garner on Staten Island awaiting a proper investigation. That’s right, it was announced that for two weeks in August (until 8/26) police will be using their time wisely, looking for bikes riding the wrong way on the certain random parts of the streets.